Kick-start your Business Process Model and Notation training today by taking an accredited BPMN 2.0 eLearning course! Created by the experts, learn how to confidently map consistent and logical organizational processes in line with version 2.0 of the business process modeling global standard. The course will teach you how to adhere to a common modeling method, allowing you to create diagrams that can be shared consistently across all business domains. Learn from the experts with step-by-step tutorials that teach you how to create precise business processes using the BPMN 2.0 standard. Business Process Model and Notation – BPMN is the de-facto notation standard for business process modeling and provides a common graphical language for end-to-end business process workflows that can be readily adopted and understood in all areas of the business. This course will teach you how to create good BPMN models with clear process logic that can be shared across your organization. You will learn how to create end-to-end diagrams that are correct according to the rules of the BPMN specification. Why Study BPMN 2.0 With 4PA? Principles of BPMN Style: The rules for diagram composition and usage to ensure consistency across the business and maximize a shared understanding. The BPMN Method: A prescriptive methodology for going from a blank sheet to complete and properly-structured process models using BPMN 2.0. The vocabulary of BPMN in “levels”: Level 1 – a basic working set familiar from swimlane flowcharts | Level 2 – focusing on event-triggered behavior. Our courses are easy-to-use. Students will benefit from an interactive multimedia environment that enhances the way you study BPMN. Maintained by the Object Management Group, BPMN (Business Process Model and Notation) is the de-facto notation standard for business process modeling. It provides a common graphical language for end-to-end business process workflows that can be readily adopted and understood in all areas of the business. BPMN is a generic standard designed for adoption across all industries and business communities. Why Adopt BPMN for Your Organization? First launched by the BPMI in May 2004 as version 1.0, the specification has since been revised periodically and BPMN 2.0, released in January 2011 was quickly adopted by organizations worldwide. This is an interactive eLearning course, with audio and video narrative training and step-by-step exercises. You can practice your skills with prescribed “in-class” exercises using the Orbus Software BPMN 2.0 Visio template. Why take a week off work and travel to your classes? Study independently and avoid the high cost of classroom-based BPMN training. Our BPMN eLearning training course has been written by leading experts and authorities in the application of BPMN. Start your BPMN course straight away! Access the course and materials from the moment you log in. Everything you need for the training course is provided online in with a visually stimulating, easy-to-use, interactive format. The course is supported by multiple choice quizzes to check your understanding of course material. This eLearning course will teach you everything you need to create precise BPMN process models that can be clearly understood and adopted by the wider business. Our course has been designed & written by leading BPMN training experts. You can practice your skills with prescribed “in-class” exercises using the Orbus Software BPMN 2.0 Visio template. In this module you will learn about pools, lanes, and activity types, and the important role sub-processes play in hierarchical BPMN models. In this module you will learn about collaboration, the message flows indicating interactions between the process and external entities such as the Customer, service providers, and other processes, essential to a complete process model. In addition you will learn the rest of the shapes and symbols in the BPMN Level 1 palette. In this module you will understand the precise meaning of BPMN’s most fundamental concepts and why they are critical to properly structured models. You will apply them in the first two steps of the Method, Scoping the Process and the High-Level Map. In this module you will translate the High Level Map into a top-level BPMN diagram, and then expand each High Level Map activity in a separate child-level diagram. You will also learn how to add message flows to the model, replicating the collaboration from child to parent level. In this module you will learn the basic elements of BPMN Style applicable to Level 1 process models. In this module you will learn about the BPMN metamodel, XML, and rules, and the importance of model validation, along with suggestions for further learning. 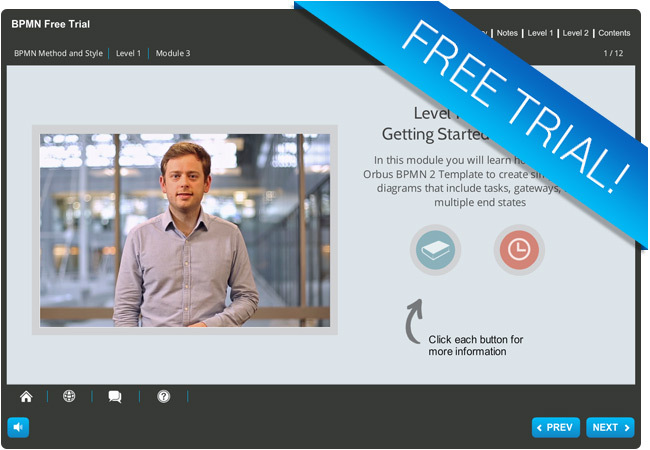 Why not try out a free trial module from our BPMN 2.0 eLearning course! In this BPMN 2.0 trial module, you will learn how to create simple BPMN diagrams that include tasks, gateways, and multiple end states via a mixture of interactive and audio techniques to enhance the learning experience. Like the full BPMN 2.0 eLearning course, you can access this free trial module from any device whether you are at home, at work, or on the move!